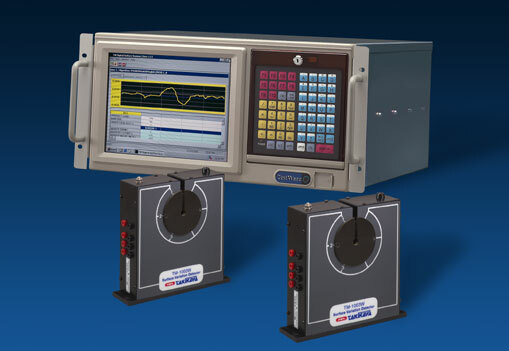 Takikawa's TM Series Surface Variation Detectors were designed to provide users with a reliable continuous high speed method to detect surface variations in optical fibers, enamel, electric and vinyl wires, communication and power cables, metal and glass rods, pipes and hose. Takikawa manufactures 16 different variation detectors to suit your individual application needs. Diameter Range 0.0007" ~ 0.315"
Detection Sensitivity 0.0004" ~ 0.040"
Slit Length 0.708" 0.472" 0.708"
Recorder Output +/- 1V / 0.004" +/- 0.5V / 0.004" +/- 1V / 0.004"
Diameter Range 0.004" ~ 1.5"
Detection Sensitivity 0.002" ~ 0.400"
Recorder Output +/-100 Mv / 0.004"
Diameter Range 0.004" ~ 2.36"
Detection Sensitivity 0.006" ~ 0.395"
Diameter Range 0.040" ~ 3.15" 0.040" ~ 5.2"
Detection Sensitivity 0.008" ~ 0.395"